Every year, millions of people graduate from colleges throughout the U.S. — meaning that more and more people are now struggling to pay off the tens of thousands or hundreds of thousands of dollars they have accumulated in student loan debt. For many, it is unlikely that they will be able to pay off these loans for several years to come. Even so, federal bankruptcy laws have made it increasingly difficult for debtors to discharge student loans through bankruptcy. While it’s not impossible, most filers will not be able to eliminate student loan debt through Chapter 7 or Chapter 13. In order to do so, one would need to demonstrate that it has caused them undue hardship. Discharging student loan debt is difficult but not impossible. Discuss your options with a Dallas bankruptcy attorney at Allmand Law Firm, PLLC to learn more. According to the United States Code Section 523(a)(8) of Title 11, student loans are not dischargeable unless those loans “impose and undue hardship” on the loaner. However, it is important to keep in mind that bankruptcy courts will use different tests to determine whether or not a debtor has experienced undue hardship. One of the most common is the Brunner test, which examines three important factors. Can the debtor maintain a minimal standard of living while repaying their loans? Would the debtor remain in poverty for the duration of the repayment period? Has the debtor made a good faith effort to repay their student loan debt? If you pass this test, there is a chance that you could have your student loan fully or partially discharged in bankruptcy. However, since “undue hardship” is not defined within bankruptcy law, this decision will be made at the discretion of the court. For this reason, it is imperative that individuals considering such an option retain the help of an experienced lawyer. Failure to do so can result in a lesser chance at receiving a favorable outcome. Request a free consultation with the Student Loan Attorneys at our firm to find out more. If the Limited Exception Does Not Apply, Can Bankruptcy Still Help Me? The short answer to this question is “Yes, bankruptcy can still help even if the limited exception does not apply.” How? If you are facing student loan debt, you have probably been faced with annoying phone calls, emails, and other notifications that let you know you are behind on payment. While bankruptcy may not dissolve your student loan debt, bankruptcy can stop collectors from bothering you for up to 5 years. This can provide you with enough time to secure a reliable payment plan. Because these types of situations are highly complex, it is best to speak with an experienced lawyer regarding your unique situation. Without a hardship exemption, there’s no way to fully discharge student loans by filing for bankruptcy. However, if you’ve filed under Chapter 13, you can roll your student loan payments into your Chapter 13 repayment plan. The debt will survive the bankruptcy process, but there are some thing you should consider. For instance, Chapter 13 is a kind of reorganization bankruptcy. It’s not the only kind of reorganization bankruptcy and there are limitations on who can apply, but for individuals or couples, it makes more sense than Chapter 7 in a number of situations. Chapter 7 can only discharge qualifying unsecured debt. But Chapter 13 can also discharge qualifying unsecured debt. The catch is that you may have to pay some of that amount back in your repayment plan. In a Chapter 13 bankruptcy, student loan debt is considered non-priority unsecured debt. While it cannot be discharged (and will thus survive the bankruptcy), you don’t have to make the entire monthly payment in order to keep the loan from going into default. Additionally, student loans receive a pro rata share of your repayment. While this amount is usually less than the amount you would be required to pay outside of bankruptcy, it will make a dent in the amount of funds you have to pay off unsecured debt. This amount will also potentially help you qualify for reductions on your secured debt. In Chapter 13, you can discharge unsecured debt just as you would in Chapter 7. After your secured debt and priority unsecured debt is accounted for in your repayment plan, the rest of the unsecured debt is discharged. How much of your student loan debt you repay during your Chapter 13 will need to be agreed upon by the bankruptcy trustee since it reduces the amount income you can put toward your debt. Should I File for Bankruptcy to Manage My Student Loans? Bankruptcy does not handle student loans very well. If you have an unmanageable amount of debt, bankruptcy can help you discharge some, which will free up your income to make consistent payments on your student loans. In this case, you can prevent your loans from going into default by discharging other debt obligations. If you have a lot of unsecured debt, filing for Chapter 7 can help reduce your total debt obligation. If you have more secured debt, you can file under Chapter 13. You may qualify for a cramdown which allows you to reduce the amount of total debt you have on a specific property. Both of these options offer benefits and both have consequences. The general rule of thumb is to ask yourself whether you can manage your current debt obligations and, whether you are in danger of having your wages garnished, your bank accounts levied, or other aggressive creditor actions. If the answer is yes, then bankruptcy can only help you since your credit is already in freefall. Once you’ve settled old accounts, you can begin rebuilding your credit and making payments on those debts that could not be discharged by your bankruptcy. 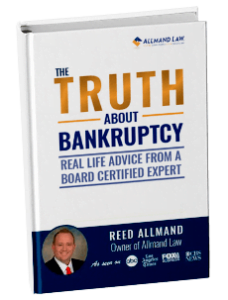 Our lead attorney, Reed Allmand, is also board certified in consumer bankruptcy law by the Texas Board of Legal Specialization. For this reason, you can trust that your future will be in good hands. Contact our team to get started on your case with a free consultation session. You have nothing to lose and everything to gain. Have Questions About Student Loan Debt? Does the Automatic Stay in Bankruptcy Stop Student Loan Collections? Contact Allmand Law Firm, PLLC today to request your free consultation.